George had his leg x-rayed and it turns out it isn't broken, which sure is a relief to me - I wasn't quite ready to become a full-time rancher. He and mom were out early Sunday morning and I (finally) had a bit of good news to share with them: Mama cat had her babies. 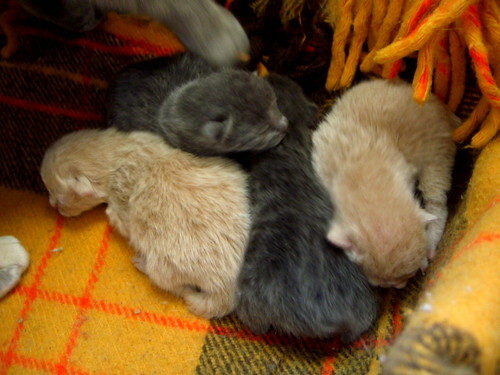 She had two grey and two yellow kittens - all healthy and unbearably adorable. And the most exciting part is that two of them have bobbed tails! Which leaves no question as to who the papa is...that ol' rascal Max. I'm like a proud grandma and can hardly wait for how ridiculously cute those little Manx kitties are going to be. just a few hours old, originally uploaded by EMprint.